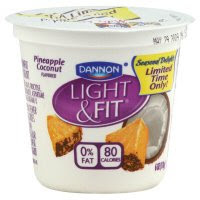 I'm a big fan of Dannon Light & Fit yogurt, but I'm a SUPER FAN when it comes to Limited Edition anything. I had been hoping to find their new Seasonal Delight flavors because two of the five are Pomegranate Berry and Pineapple Coconut. This past Thursday we went to see Penn & Teller at the MGM Grand Theater at Foxwoods in CT. We decided to make a quick pit stop at Price Chopper to get a gallon of milk because it was on the way home. It was around 10:30pm as I approached the dairy aisle with my selection of 2% milk. I figured, "What the hell?" as I approached the dairy case holding all of the different yogurts. I gingerly approached the section where Dannon yougurts were neatly stacked and to my shock there it was-the Holy Grail of Active Yogurt Cultures: Pineapple Coconut. I simply couldn't believe I had finally found it. My next challenge was keeping these little beauties away from Spencer. But since these new limited-edition flavors were so valuable to me, I left them in the Price Chopper bag and hid them in the fruit drawer because I thought that was one location in our fridge that I would never have to worry about being invaded because he's not much of an eater of fruit. Or produce, for that matter. Today I finally was in the mood for some yogurt. I opened up the fruit drawer and took out the bag filled with cups of Dannon yogurt. Spencer was in the kitchen with me sort of hovering as I closed the door and I said, "You want one? Have one...but don't eat all the Pineapple Coconut 'cause I want to try it." I gave him one and I took one back with me to the desk. I peeled back the cover and gently swiped my tongue against the foil. I silently prayed that I wouldn't be disappointed in the much sought after flavor. So how was it? Did I like it? Yes! Yes! Yes! It tasted delicious. It was like having a Pina Colada smoothie in a cup. It was totally worth the wait and I loved every spoonful. The little flecks of pineapple added a touch texture, but I thought, as I was scooping it out, that it just needed a little something more. I remembered the pint of Strawberries sitting on the second shelf inside the fridge. I thought to myself that those berries would be the perfect compliment to this healthy snack. Just as I was standing up to head back into the kitchen, I heard Spencer say enticingly like Homer Simpson, "Mmmm...Strawberries." I looked over and there he was happily chomping one of the strawberries that he had just plucked out of it's plastic container. Well, vacation is officially over and it's back to Bose tomorrow. I had an amazing 11 straight days away from the office and enjoyed a very good vacation. Each day I found myself counting on my fingers how many days I had left of the vacation. I know that sounds kind of weird because I really should have just been enjoying myself rather than participating in my own personal count-down , but I couldn't help it. Perhaps I place far too much emphasis on vacations? Spencer tells me that I have to stop thinking of my vacation like it's an all or nothing event. Of course he's right. Before the vacation I wrote down lists of things to get done since I had all that time off. I was going to get my car detailed, visit Walden Pond and hang up mini-blinds and balance the check book. Instead I had a very nice and relaxing vacation. We stayed overnight in Freeport, Maine. I got the Mazda 3 inspected. I got caught up on all my RSS feeds and cleaned out my in box. We saw Penn & Teller at the MGM Theater at Foxwood Casino this past Thursday night. I went clothes shopping and had lunch at Red Robin. We took Minnie to the park and I cooked up some burgers. And how can I forget this past Saturday when I finally got around to organizing all my office supplies down in the basement. You may not think this would have been a big deal, but it was office supplies and anyone who knows me can attest that I love me some office supplies. Everything is finally organized and has a place. It feels pretty good. I read a little bit this afternoon and took my last long nap of the vacation. But it's OK. I know there are more fun things to come my way. I'm looking forward to the start of Summer and soft serve ice cream although I'm not sure in which order. Target Lady Has A Friend! I LOVE LOVE LOVE this (fake) blogger from Bitchpleeze.com. Saturday Night Live has really done a great job with this season's cast. Foxy Lady 1 from Scott Terrasi on Vimeo. Yesterday it was some unknown man dressed in a white linen suit – today I got to see an honest-to-goodness red fox! I grabbed my trusty pair of binoculars and stood there watching the red fox. He stretched and his little back legs extended just like puppies do. His front feet were jet black and his tail was so bushy. (I wonder if a fox wags its tail like a dog?) Several of my co-workers gathered around the window and we looked down at the fox lying out in the sun near the right of the shrubbery. We all collectively made unusual baby-like sounds several times which put me in the mind of all those women ogling the hot construction worker in that Coke commercial from a few years ago. Who knew a fox could be that cute? The most interesting thing about this fox sighting is I’ve never seen one in the wild before. Maybe two week’s ago I went out to dinner with my friend Ginny and we saw a red fox running around the edge of the back parking lot of Piccadilly Pub in Westborough. At first I thought it was a little dog and then we realized it was a fox. Eventually the fox stood up and moved out of sight and into the bushes. I can’t wait to see what tomorrow brings. Working on the fourth floor of an office building is usually a pain because you’re either huffing it up the stairs or taking the elevator to get to your office. There aren't many advantages to being on the fourth floor of a six story building…except for today. Turns out the fourth floor places me in the perfect position of looking outside the windows (in the back of the building) to spy on people as they walk through the parking lot. Most days the only action we see is a traffic back-up from California Ave to Route 9 or a deer snacking on some shrubs in our meticulous landscaping. But today was special. His shape was rather ambiguous so I grabbed a pair of binoculars and checked him out up close because I was having difficulty believing a man would dress all in white. I focused the lenses and sure enough he was adorned in white –even his beard was white which answered my question of gender. I think it’s pretty brave of a man to dress all in white, but it’s even braver to go out in public with black sandals on looking like a fugly hot mess. Framingham isn’t Miami Beach. 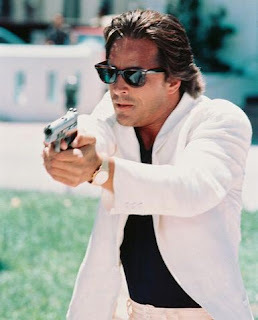 This is not Miami Vice. No linen suits are allowed. This guy should have been wearing an unassuming pair of beige chinos and a nice polo shirt if he wanted to celebrate the warm weather. I Dunno. Maybe it’s me, but I think that’s how men in New England roll. I know this sounds a little self-indulgent, but I haven't been myself lately. I think I've been struggling with finding that happy balance between work and home life. I mentioned to Spencer recently that I think I give my best efforts when I'm at work. After I'm walking out of the building, my first thought is what's for dinner and then what will I be watching tonight on TV? A Netflix movie or watching Rescue Me . I realized that I'm not blogging anymore which is something I enjoy doing. So my first baby step to regain some of that work vs. life balance. In the time since my last post I've come across several interesting things that I wanted to write about. For instance, the other day I was stopped at a red light and the man in the car next to me was trimming his ear hair. Ewwwww. I couldn't grab my phone fast enough to snap a photo, but moments like these are what I live to write about. I figure I have a fighting chance to take back what's mine now that Lost, Fringe, Prison Break, House and American Idol are nearly done until the Fall season.